With freezing temperatures, snow and strong winds in the forecast, think about protection your pets. The Suffolk County SPCA recommends bringing your pets inside during cold winter weather. 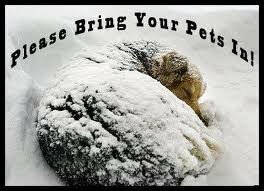 Suffolk County, NY - January 1st, 2014 - With freezing temperatures, snow and strong winds in the forecast, think about protection your pets. The Suffolk County SPCA recommends bringing your pets inside during cold winter weather. Hypothermia can result from extended exposure to cold and is life-threatening condition. Be Alert to Frostbite: Skin can turn red, white or gray and scaly. If you suspect frostbite, contact your vet immediately. Dogs who are ill, old, very young, or shorthaired cannot endure prolonged exposure to winter weather. Take them out only to relieve themselves. Many dogs need boots in winter weather, regardless of coat length. If your dog frequently lifts up his paws, whines or stops on his walks, his feet are uncomfortably cold and may need dog booties for his paws. Dogs left outdoors in inclement weather must be provided with shelter appropriate to breed, physical condition and the climate. Minimum standards for adequate shelter include a permanent structure with a waterproof roof, structural soundness, and sufficient insulation to protect from the inclement weather, space to make normal postural movements, freedom from excessive dirt, trash, or waste, and a clean surrounding area that does not threaten the well-being. If you have bunnies who live outside, make sure they have a warm, dry hutch with plenty of bedding that is out of the wind. Water is important too as is some extra food. Cover the hutch with a tarp. For outdoor pets, make sure your pet has fresh, non frozen drinking water available. And remember, clean your pet's feet. Salt can irritate or burn, as well as causing vomiting and in some pets can even cause seizures. Antifreeze has a sweet, attractive smell to pets and can be deadly if ingested. Remember this is the law and will be enforced! Remember if you feel cold so do your pets. Subject: LongIsland.com - Your Name sent you Article details of "Suffolk SPCA: Keep Pets in Mind During Winter Storm Watch"